Shrewsbury Town are currently running polls to find out who fans would include in their greatest eleven, allowing the In The Community team to create a mural on the South Stand of the New Meadow (full details can be found here). The club have limited the nominations to those players that have appeared more than 100 first team appearances, which mean some of my favourite players miss out, players like Grant Holt, Marc Tierney and David Hughes that I would have included don't make it on to the list. As always I can only base anything like this on what I've witnessed, which mean that club legends won't be included. 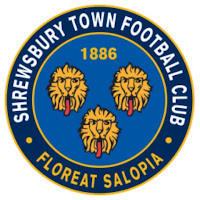 Arthur Rowley, Alf Wood, Graham Turner, Peter Dolby and Chic Bates would probably find their way in to the team but I've only got the 20 or so years that I've been supporting Shrewsbury to draw on in picking my team. Looking at the percentages that most players got, it was quite conclusive about the supporter sections, only Bob Wardle got below 25%, but then again we have been blessed with some great Goalkeepers. I'm fairly impressed that two players that I chose ended up in the final team, given the limitations I imposed upon myself.